A classic recipe for Baklava, the traditional Greek and Turkish pastry made with ground nuts and layers of phyllo dough, drizzled with a spiced honey syrup. A wonderful addition to holiday dessert spreads or something extra-special for any other time of the year! Long, long ago when my husband and I were dating and he was still living in the DC suburbs, we happened upon the Northern Virginia Summer BrewFest, a massive festival with tons of beer and food tents. After getting our tasting glasses and sampling brews such as watermelon beer, we hit the food tents. On our way out, we walked past a little Greek food tent manned by an older couple. They were charming and the pastries looked unbelievable; we loaded up on some baklava and headed home. Later that night, we dug in and I suddenly remembered how absolutely phenomenal baklava is. Layers of buttery, flaky phyllo dough are piled high between sections of spiced, ground walnuts. Once baked and golden brown, the entire pan is drowned in a spiced honey syrup, which is left to soak in for hours. It’s sweet, a little sticky, a little spicy, and fabulously nutty. I immediately emailed a friend who had deep Greek roots and asked if she had a recipe. She gifted me with her grandma’s recipe, and I made it a few months later for Thanksgiving. It was a rousing success, and it’s the only recipe I’ve used since. The first mention of a dessert resembling baklava goes way, wayyyyyy back to the BC age, which is incredible. 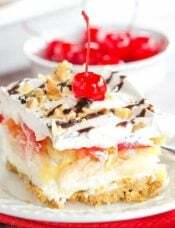 The Greeks and the Turks still argue as to where the recipe originated, but the oldest version of this recipe (a baked dessert with layers of dough and covered in honey) shows up in the Roman Empire, and Greek and Turkish cuisine both built upon cooking traditions from the Byzantine and, later, Roman Empires. When I do recipe research, it rarely, if ever, goes back THAT far. Amazing! How Do You Make Baklava? First you’re going to make the syrup by combining the water, sugar, honey, cinnamon stick and orange peel in a small saucepan and bringing to a boil, then simmering for about 15 minutes. 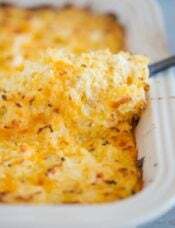 You’ll set that aside to cool completely while you assemble and bake the dish. Next, give the walnuts, cinnamon and cloves a spin in the food processor to get them to a medium-fine ground consistency. Too fine and you’ll end up with nut roll filling, but too coarse and the layers would adhere properly. Then comes assembly! This is the labor-intensive part of making baklava, but it’s super simple, so put on some music and work away. 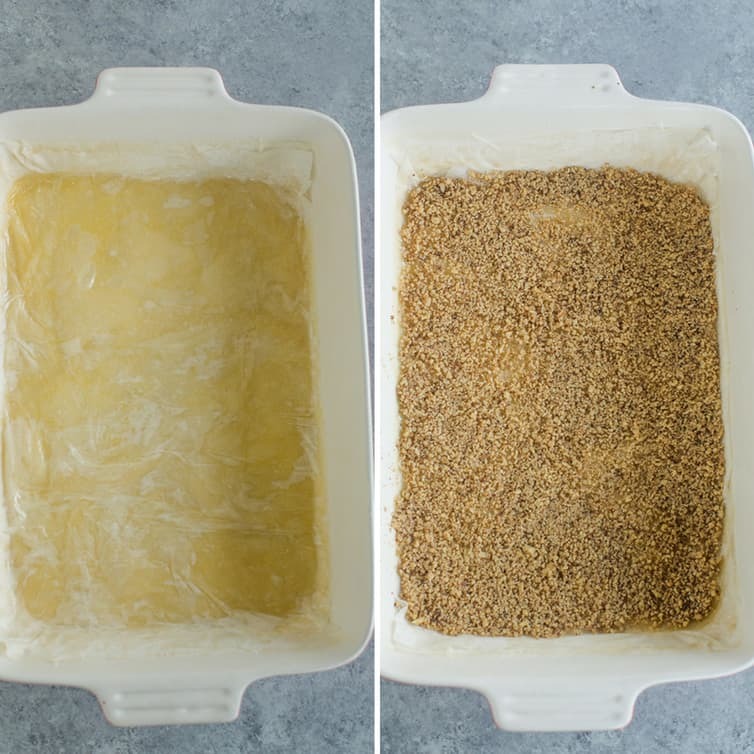 Each sheet of phyllo dough needs to be brushed with butter before another is added, and the butter needs to stay completely melted and warm the entire time. It’s also recommended that you cover the sheets of phyllo with a damp kitchen towel while you’re working so that they don’t dry out (they are very delicate to work with!). 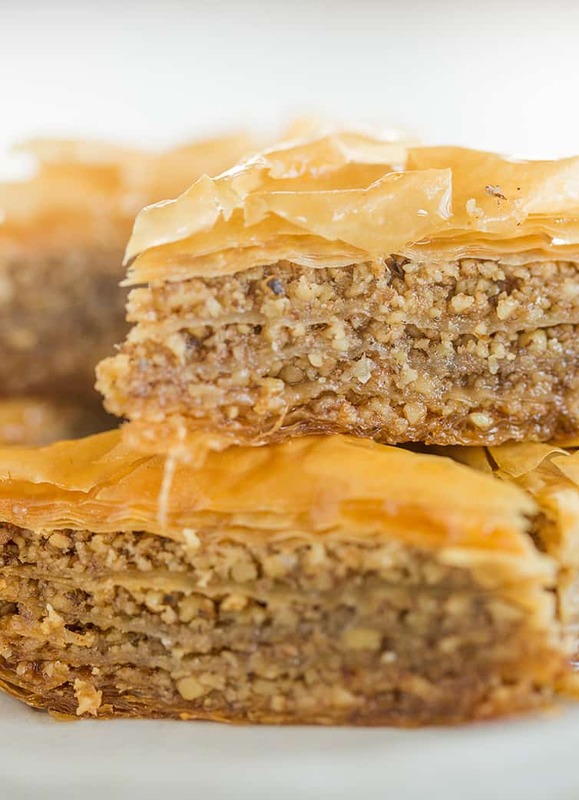 After layering your phyllo and ground nut filling, you’ll slice the baklava into diamonds and bake until golden brown. 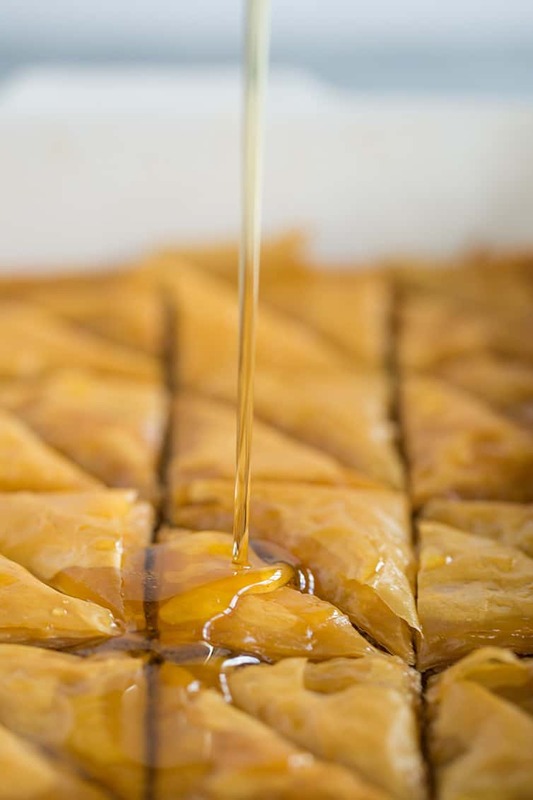 As soon as the baklava comes out of the oven, grab the honey syrup and pour it all over the top, making sure to get it into all of those crevices, as well. You’ll hear lots of crackling, which is a glorious sound! Then… you wait. At least four hours, but ideally overnight. Can you use nuts other than walnuts? Yes! By all means. Pistachios and almonds are used quite often in baklava. Can baklava be made ahead? Yes, as mentioned above, this is an excellent dish to make ahead of time, as it’s actually better the longer it’s left to sit before it’s eaten. Covering it with a loose paper towel will ensure that it maintains its crispness. Can baklava be refrigerated or frozen? Yes to both! 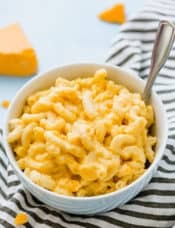 Keeping it at room temperature maintains that crisp texture, but you can store it in the refrigerator in an airtight container for up to 2 weeks, it will be a little bit chewy and harder than at room temperature. You can also wrap individual pieces of baklava in plastic wrap and store in freezer ziploc bags in the freezer for up to 3 months. Why is my baklava soggy? This is likely due to using too much butter when brushing the phyllo sheets. A thin coating of butter is all that’s needed. Why is my baklava dry? 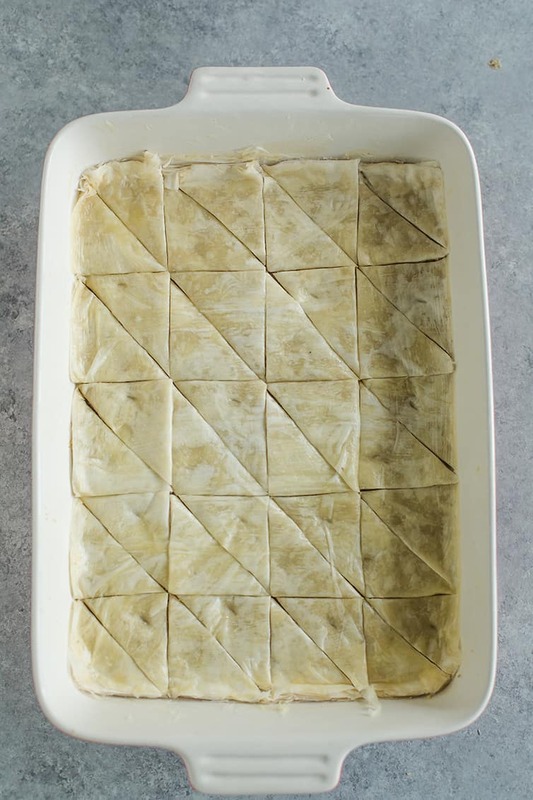 Be sure that when you brush your layers of phyllo, and especially the top layer, that you are brushing all the way around the ends and in the corners. You don’t want to leave any areas of phyllo exposed, or they will dry out. Can you make baklava without nuts? I have seen recipes online that substitute things like sesame seeds, coconut, dried apricots and raisins, etc. for the nuts in baklava. I’ve never tried any of them so I can’t attest to how close they are to the real thing, but they do exist! Can you make baklava without honey? Well, honey does impart a lot of the characteristic flavor of baklava, but you can do without it. A simple sugar syrup can be poured over, or you can flavor it with things like rose water. You could also use agave nectar. Baklava makes a fantastic addition to any holiday sweets collection, wedding cookie table, or special celebration. 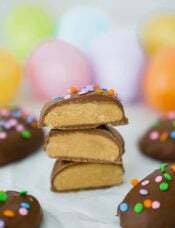 Use this recipe as-is, or as a jumping off point for experimenting with different nut combinations and syrup flavors (you could even use lemon peel instead of orange peel!). This is a classic recipe that every kitchen needs to have stashed in their recipe box! 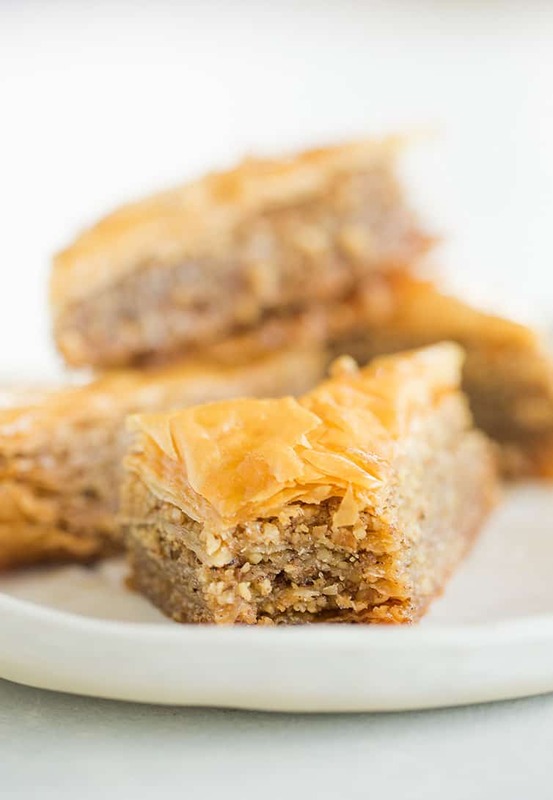 A classic recipe for Baklava, the traditional Greek pastry made with ground nuts and layers of phyllo dough, drizzled with a spiced honey syrup. Make the Syrup: Combine the water, sugar, honey, cinnamon stick and orange peel in a small saucepan and bring to a boil over medium-high heat. Reduce the heat to low and simmer for 15 minutes. Remove from the heat and let cool to room temperature. 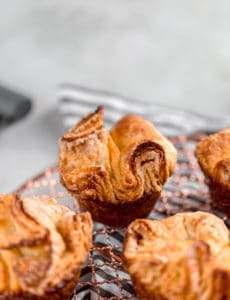 Make the Baklava: Preheat oven to 350 degrees F.
Place the walnuts, cinnamon and cloves in a food processor and process until the walnuts are finely ground. Melt the butter in a small saucepan over very low heat, keeping it warm throughout the process so it doesn't start to solidify. Brush a 9×13-inch pan with melted butter and place one layer of phyllo at the bottom. Brush the phyllo with the melted butter, and then add another layer of phyllo, and brush with more butter. Continue this process until you have layered 7 sheets of phyllo. Gently spread one-quarter of the nut mixture evenly over the top of the phyllo. Repeat the process of layering phyllo sheets and brushing with melted butter, but this time use only 5 sheets of phyllo. Gently spread another one-quarter of the nut mixture over the top of the phyllo. Repeat this twice more, layering and buttering 5 sheets of phyllo and topping with one-quarter of the nut mixture. Finish off with 7 layers of buttered phyllo. Brush the top sheet with melted butter, as well. Using a sharp knife, trim any ragged pieces of phyllo dough that has crept up the sides of the pan. Cut the baklava into 12 even squares, and then cut into triangles (you should have 24 triangles). Place the pan in the oven and bake until golden brown, about 50 minutes. 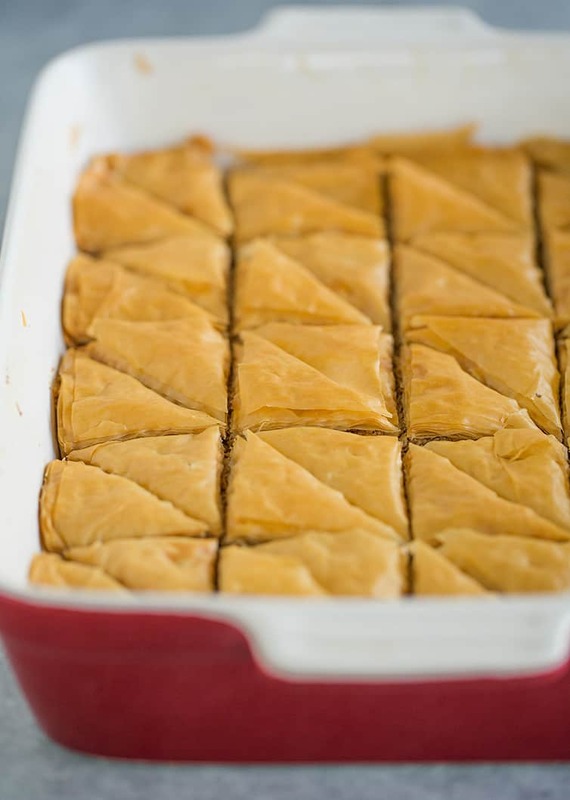 As soon as the baklava comes out of the oven, remove the cinnamon stick and orange peel from the syrup and slowly pour it over the hot baklava, making sure to get it into all of the cracks and crevices, as well as on the top surface. Allow the baklava to sit for at least 4 hours before serving so the syrup has a chance to soak in. (The baklava is actually best when left to sit overnight before serving.) Baklava can be stored at room temperature, covered very loosely with a paper towel or foil until ready to serve. Leftovers should be stored in airtight container at room temperature or in the refrigerator for up to 2 weeks. Other nuts, such as almonds or pistachios, can be substituted for the walnuts. Baklava can be frozen in individual pieces for up to 3 months. This recipe was originally published on September 12, 2012. This is fantastic! My first time making the dish I look forward to every year at our local Greek Orthodox Church’s Food Festival. This recipe is just perfect. I added a chopped pistachio topping as a little variation but it would have been fine without that. OMG, it is so delicious. My family loved it. No matter how much syrup I use on my baklava, the top of the baklava always stays dry and falls off while trying to eat it! What can I do to prevent this? Hi Michele, I would try drizzling the syrup in batches, and making sure it absorbs in between, and not just sliding off that top layer. I hope that helps! What is the nutritional information on this please . Hi Matt, I’m working on getting that information included for all recipes. Keep checking back! WOW! Wonder Baklava recipe. Looks delicious. Will try soon. Hi Glori, I’ve never done this, I just don’t know how the phyllo would hold up to being brushed with butter and then sitting. You don’t want to put it in the fridge because the butter would solidify. 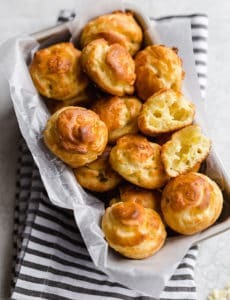 Honestly, if you go through the trouble of assembling it, I would just bake it the same day, as it tastes even better after sitting overnight. Thank you for sharing the recipe! I have never heard of Baklava, it’s so nice to know a new dish. 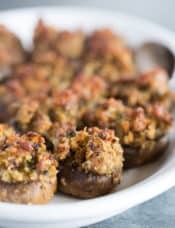 I have made this recipe many, many times over the past few years. It always gets rave reviews. In fact many claim it is the best they have ever had. It isn’t difficult, but I always like a second hand – one to butter and one to layer. Thanks for posting it! Oh this looks so good. I love baklava. 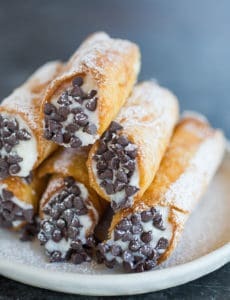 One of these days I’m going to get over my fear of making it and try this recipe. 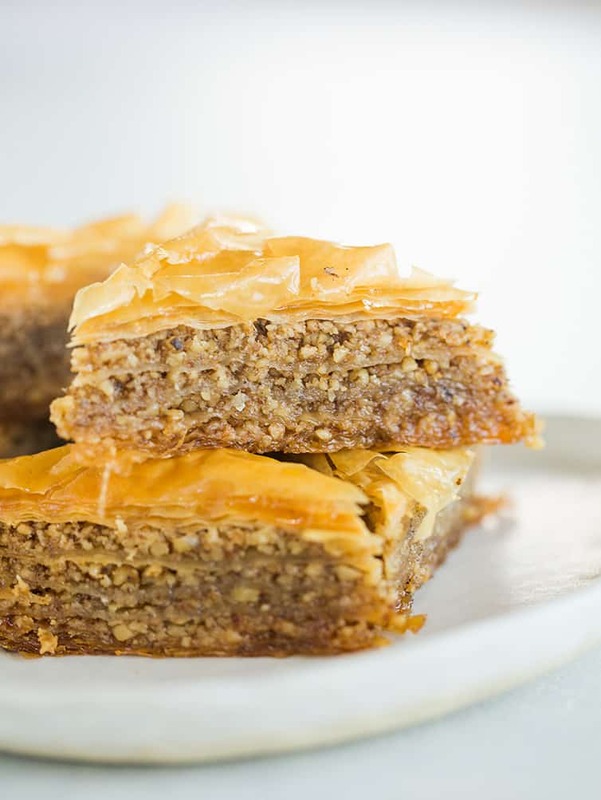 Do you cut the baklava through all layers or just the top seven? 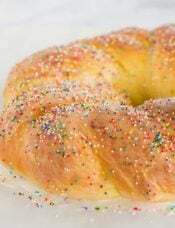 I will definitely be making this and your but roll recipe this year for Christmas. The but roll reminds me of our sweet neighbor who just died at 89 years. She made the best but rolls. Thank you for all your wonderful recipes and stories. Baklava is such a great treat! Looks so delicious! ALSO!!! If your phyllo breaks on a dry day, don’t fret!! You can make a “Patch Quilt” out of the pieces. The melted butter will glue everything together seamlessly! Don’t be scared to try it!!! I’ve been making Baklava for 22 years and this recipe is VERY close to mine so I KNOW it’s delicious!! OPA!!! Ohhh this looks so so good. I never thought I could try it myself but this doesn’t look too hard :) Yummo! I LOVE baklava. Always thought it would be really superdifficult, but when I saw your recipe on here I thought it seemed totally manageable! It’s quite possible that I lost count with the sheets, but I actually didn’t use an entire box of 16 oz of phyllo dough. No problem…I’m definitely making it in a couple of weeks for our Christmas celebration so the leftover phyllo dough will be used quickly! Thanks for yet another awesome recipe.